With the exceptions of oil-rich Basra and Maysan, the Shiite-majority governorates south of Baghdad are frequently referred to by observers as the loyal fiefdoms of the Islamic Supreme Council of Iraq (ISCI), America’s and Iran’s principal partner among the Shiites of Iraq. However, on the eve of Arba‘in – a holiday marked by the Shiites as ending the 40-day mourning period for Imam Hussein that starts on Ashura every year – Shiite Islamist politicians in the southern city of Nasiriyya have engaged in an intense internal struggle about the local security forces, casting doubt on the image of ISCI hegemony. On 25 February, a two-thirds majority of the governorate council decided to dissolve the local security council and transfer its powers to the local police chief instead. This development is noteworthy for two reasons. Firstly, it is taking place in a setting – the provincial council – where no Sadrists are represented because they boycotted the January 2005 local elections. In other words, it is other Shiite Islamist forces, primarily Fadila but probably also at least some members of Daawa (Tanzim al-Iraq) that are behind the move. Whereas ISCI originally had managed to install their own man as governor of Nasiriyya, they are now being threatened from within in one of their supposedly “safe” constituencies. In this respect, Nasiriyya could be a bellwether for this autumn’s provincial elections: despite ISCI’s dominance in terms of numbers of governors, many of “their” governorates south of Baghdad (including Karbala, Qadisiyya and Samawa) have a rather complex party structure. The Sadrist challenge would come on top of this, as they are now signalling an eager desire to engage in electoral politics. Secondly, it is significant that ISCI’s opponents are deciding to strengthen the powers of the local police. This means that the image of full ISCI dominance in the security apparatuses of the south probably requires more nuance. In the case of Nasiriyya, it is actually ISCI who are now complaining about “party loyalties” exercising influence in the police force. That could be a result of increased local competition by other local parties asserting themselves in the security apparatus, but it could also be an expression of a conflict between ISCI and parts of the security forces that are more loyal to Nuri al-Maliki (and the central government) than to Abd al-Aziz al-Hakim – two leaders that increasingly have been at odds with each other over the past months. 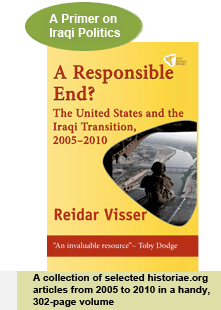 The law on the powers of governorates not organised in a region was adopted by the Iraqi parliament on 13 February, but much of the reporting surrounding it in the Western mainstream media has been highly misleading. Full story here. Whenever Iraqi politics becomes difficult to classify according to the ethno-sectarian mindset preferred by most Western commentators, interest in what is going on in Baghdad seems to dwindle. Little wonder, then, that for the past few weeks, somewhat esoteric news items have dominated press reports from Iraq. The two truly significant developments during the past month have received less coverage: the attempts to agree on a general budget, as well as efforts to pass a law on the powers of governorates nor organised in a [federal] region. Full story here.